DEEP Learning’s Global Teaching and Learning conferences offer a unique format that allows participants to easily differentiate their learning and develop take-aways that can be brought back to the classroom. In most classrooms today, teachers are keenly aware of their students’ learning differences and struggle to figure out how to address those differences in ways that benefit both the individual learners and the class as a whole. Differentiated Instruction is a way of thinking about the classroom that involves attending to individual and small group needs while moving the whole class ahead in knowledge, understanding, and skill. This two-day workshop is designed to help teachers develop a sound understanding of the principles and practices that are evident in effectively differentiated classrooms. 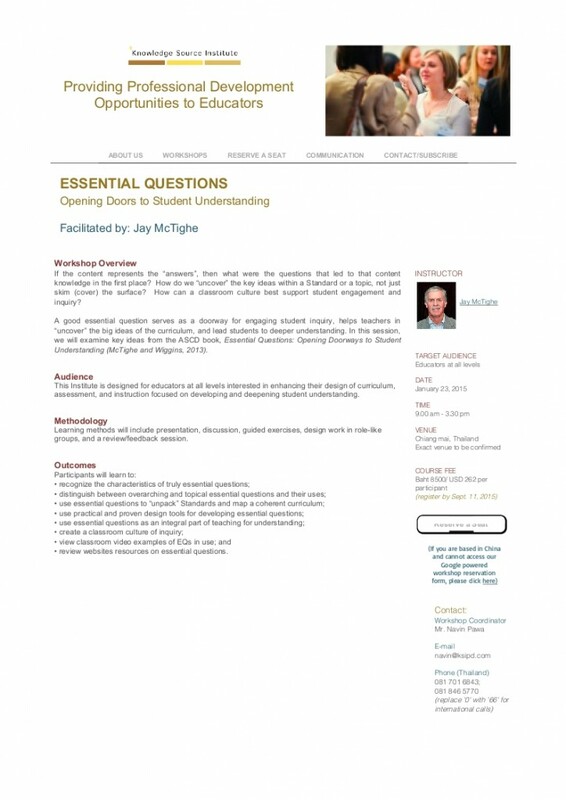 Participants will examine the role of learning environment, curriculum, instruction, formative assessment, and classroom management in designing instruction that both challenges and supports a broad range of learners. We’ll examine how each of those key elements can be shaped for maximum student growth and how they work together to enhance learning. A key focus of the workshop will be exploration of teacher lesson plans, analysis of video clips, and introduction to specific instructional strategies to model and extend participant awareness of and comfort with differentiation. The workshop will include whole group and small breakout group work as well as opportunities for individual consultation. (with Tonya Moon) Assessment in a Differentiated Classroom: A Guide to Learner Success. Her books on differentiation are available in 13 languages. In 2013 Carol was #20 on in the Education Week Edu-Scholar Public Presence Rankings of university-based academics who are contributing most substantially to public debates about schools and schooling. In that same list, she was ranked in the top five most influential voices in Psychology. Carol works throughout the United States and internationally with educators who seek to create classrooms that are more effective with academically diverse student populations. Be ready to use several instructional strategies to address learner variance in their classrooms. Using specific instructional strategies to address student readiness, interest, and/or learning profile. We would like to introduce you to Learning & Teaching Expo. We have been provided your contact information by The International School Consultancy Group. We would like to introduce the Expo to you and invite you and your colleagues to come to Hong Kong and visit the Expo. The event takes place from Thursday 11 to Saturday 13 December 2014, at the Hong Kong Convention & Exhibition Centre. If you are interested in sourcing the latest technology and resources for schools then Learning & Teaching Expo is the event to attend. As the leading annual education expo in Asia, Learning & Teaching Expo features 200+ exhibitors plus a programme of free educational seminars and presentations for school leaders and teachers. In addition the 7th annual 21st Century Learning Conference (staged alongside Learning & Teaching Expo) provides a world class line up of presenters debating how to most effectively use technology in education. Please kindly note that we are going to send you some expo information from time to time, in order to inform you of the latest developments at the Expo. If you would like to register or know more about the Expo then please visit the website: http://www.ltexpo.com.hk or contact Mr. Roney Chan at roney@ltexpo.com.hk or on +852 3105 1675.